A giant pacific octopus mother who lived just across from downtown Seattle had her hatch right under the noses of local divers. Her den was sequestered in Cove Two in West Seattle, in a location that spared her from predators and over-visitation by humans. On September 4 (aka early, early on September 5), 2010, the eggs began hatching. It's a time of mixed emotion; joy at the hatch, and sadness at the knowledge that this event means the mother's life will end. The hatch lasted a full week, after which the mother died. In case you needed any reminder of the awe-inspiring wonders in nature, this video will do just that. We don't know how we missed this incredible footage from last year, but we weren't the only ones, and it's definitely worth posting no matter how old. YouTube user Seainggreen documents the hatchings of a giant Pacific octopus, which can lay up to 100,000 eggs, according to Wikipedia. Sit back, and prepare to be blown away by mother nature -- jump to 3:24 if you want to get right to it. The brilliant streaks of blue and green that color the Great Lakes in this image are a contradiction. The blue in Lake Michigan and Lake Huron is sediment brought to the surface when strong winds churned the lakes. The green in Lake Erie and in Lake Huron’s Saginaw Bay is algae, which builds on the surface when winds are calm. 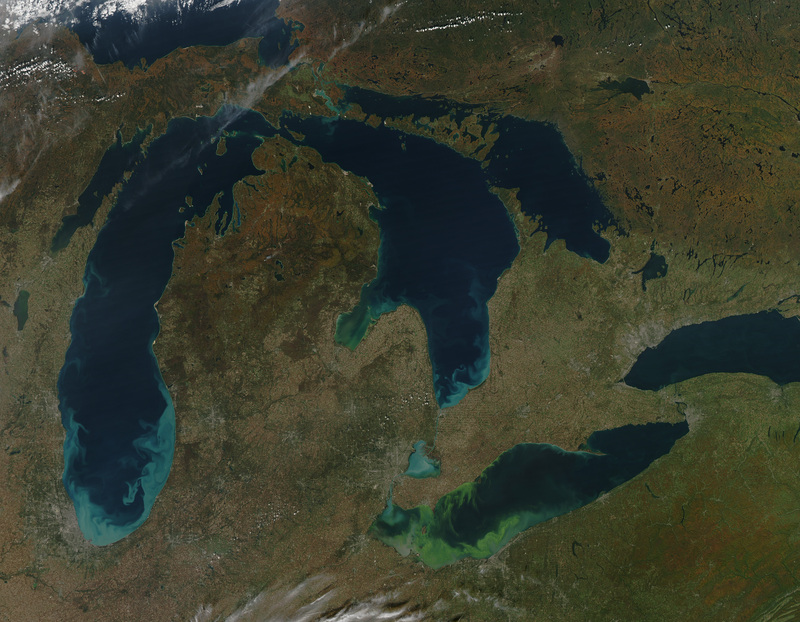 Sediment most often colors the Great Lakes in the spring and fall when transitioning weather patterns bring storms and strong winds. The winds stir the water, pulling quartz sand and silt from the lake bottom to the surface, says Richard Stumpf, an oceanographer with the National Oceanic and Atmospheric Administration. The white sand looks milky blue when viewed through the water from space. It is a good tracer, says Stumpf, illustrating how circulation in the lake moves material from the banks to the center. The Moderate Resolution Imaging Spectroradiometer (MODIS) on the Aqua satellite took this image on October 9, 2011, a little more than a week after a persistent mid-latitude cyclone moved out of the region. The storm brought strong winds to the Great Lakes region, and the resulting sediment first became visible on October 1 as the storm clouds started to move away. Some of the pale blue in Lake Erie may be sediment, but the green is an extremely large algal bloom. The algae may have initially spread across the western side of the lake because of windy weather, but calm weather and warm temperatures after the storm allowed green scum to build on the surface, says Colleen Mouw, a researcher at the University of Wisconsin-Madison. The bloom now covers much of the western half of the lake. “This is considered the worst bloom in decades,” says Stumpf. The green in Saginaw Bay is probably an algal bloom as well. Though satellite imagery cannot tell us what type of algae is growing, direct measurements of the water show that the bloom in Lake Erie is mostly microcystis aeruginosa, a toxic algae. Stumpf, whose research group monitors blooms in Lake Erie, measured extremely high concentrations (1,000 micrograms per liter) of microcystin in Lake Erie during the summer. Microcystis aeruginosa produces microcystin, a liver toxin that harms mammals. The display of color isn’t limited to the lakes. Touched by autumn, the forests around the lakes have turned orange. The California coastline is inundated everyday with a chemical soup of toxins washed down storm-drains from lawns, driveways, freeways and farmland. The resulting drainage can be a toxic brew of trash, oil, rubber, brake dust and microscopic bits of metal. Solvents, fertilizers & pesticides, along with human and animal waste are often swept into the mix. Can the tide be turned on the contamination of our waterways... can one man help raise public awareness and curb this poisonous runoff before it's too late? California has a “green” reputation throughout the country, but this reputation is largely undeserved when one considers the fact that the number of California rivers, lakes and coastal waters showing toxicity has increased dramatically since 2006, as exposed in a list of polluted waterways released today. The alarming list, submitted by the state of California to the U.S. Environmental Protection Agency and finalized by the agency on October 11, reveals that more of California’s waterways are impaired than previously known. Increased water monitoring data shows the number of rivers, streams and lakes in California exhibiting overall toxicity have increased 170 percent from 2006 to 2010, according to Nahal Mogharabi, spokesman for the California EPA, in a news release. “California has some of the most magnificent rivers, lakes and coastal waters in the country,” according to Mogharabi. Of the 215,000 miles of shoreline, streams and rivers, 30,000 miles are not meeting water quality goals, and 20,000 miles still need a TMDL. The most common contaminants in these waterways are pesticides and bacteria, followed by metals and nutrients. The report was released at a time when the state proceeds forward with the controversial Marine Life Protection Act (MLPA) Initiative to create so-called “marine protected areas” off the California coast. These “marine protected areas,” in a clear example of corporate greenwashing, fail to protect coastal waters from pollution, oil spills and drilling, corporate aquaculture, military testing, wave and wind energy projects and all other human impacts upon the ocean other than fishing and gathering. The report also follows on the heels of a June decision by the Central Valley Regional Water Quality Board to continue granting agribusiness “permits to pollute” Sacramento and San Joaquin Valley waterways in a controversial agricultural waiver program. “Clean water is vital to California’s public health, economy, recreation and wildlife,” said Jared Blumenfeld, EPA’s Regional Administrator for the Pacific Southwest. “California has done an excellent job of increasing the amount of water monitored. Unfortunately, much of the new data points in the wrong direction. The Clean Water Act requires states to monitor and assess their waterways and submit a list of impaired waters to EPA for review, according to Mogharabi. The 2010 list is based on more comprehensive monitoring as well as new assessment tools that allow the state to evaluate larger quantities of data. Many more beaches, both inland and coastal, are on the 2010 list because bacteria reached unsafe levels for swimming.This increase is largely driven by a more extensive review of data collected by counties. Better reporting of trash in waters has led to an increase in trash impairments by 76% from 2006 to 2010. California’s statewide Trash Policy is under development and will address trash impacts to both local wildlife and reduce California’s contribution to the Great Pacific Garbage Patch. The numbers of listings showing pollutants in fish are at levels too high for safe human consumption has increased 24% from 2006 to 2010, with the greatest increases seen in mercury. Rather than signaling an increase in fish contamination, this trend is due to California’s recent statewide sport fish monitoring effort. Additionally, some pollutants such as DDT are no longer manufactured and are slowly decreasing in concentration over time. Waters identified as impaired by pesticides showed a 36% increase from the prior list, likely a result of the more thorough monitoring required under the State’s Irrigated Lands Regulatory Program. “Under this program, close collaboration between the Water Boards and the Department of Pesticide Regulation has resulted in reduced pesticide discharges to surface and groundwater,” said Mogharabi. In 2010, California submitted to EPA for approval its list of polluted rivers, lakes and coastal waters. The federal EPA added several waterways to the list, including portions of the San Joaquin River, where increasing temperatures and salinity imperil salmon and trout populations. Following public comment, EPA today finalized the additions. “Today’s action will lead to the development and adoption of hundreds of pollution clean-up plans by California to restore waters to swimmable, fishable and drinkable conditions,” the press release stated. I hope that the release of the list is a wake up call to the public and the state and federal governments that California must aggressively enforce the federal and state Clean Water Acts and other laws combatting water pollution! The Brown and Obama administrations are both pushing for the construction of a peripheral canal (”conveyance”) through the Bay Delta Conservation Plan (BDCP) to increase water exports from the Sacramento-San Joaquin River Delta to corporate agribusiness on the west side of the San Joaquin Valley and southern California water agencies. A coalition of Delta residents, family farmers, Indian Tribes, grassroots conservationists and environmental justice advocates opposes the canal because it is expected to lead to the extinction of Central Valley steelhead, Sacramento River chinook salmon, Delta smelt, longfin smelt, Sacramento splittail, green sturgeon and other species. The release of the list also follows the setting of two disturbing records on the Sacramento-San Joaquin River Delta when the water year ended on September 30. First, 9 million Sacramento splittail were “salvaged” at the state and federal Delta pumps near Tracy in 2011. The previous record salvage number for the splittail, a native minnow found only in the Sacramento-San Joaquin River system, was 5.5 million in 2006. Second, the water projects pumped a record 6.5 million acre-feet of water from the Delta in 2011, according to government data compiled by Spreck Rosecrans at Environmental Defense. The previous record was 6.3 million acre-feet in 2005. It is clear that California has to get more serious about cleaning up its waterways by including pollution and other impacts other than just fishing and gathering in its strange concept of “marine protection” under the Marine Life Protection Act (MLPA) Initiative. At the same time, state officials have to abandon plans to divert more water from the Delta by constructing the peripheral canal to benefit agribusiness and southern California water agencies. Finally, the Central Valley Regional Water Quality Board must aggressively enforce agricultural water pollution in the Central Valley rather than continuing to grant waivers under a voluntary program. “Water is sacred, water is Life for all,” said Caleen Sisk-Franco, Chief and Spiritual Leader of the Winnemem Wintu Tribe. Governor Jerry Brown’s signing of four bills in the Human Right to Water package – Assembly Bill 983 by Henry T. Perea (D-Fresno), AB 938 by Assemblymember V. Manuel Pérez (D-Coachella), AB 1221 by Assemblymember Luis Alejo (D-Salinas) and SB 244 by Senator Lois Wolk (D-Davis) – is commendable. However, the administration has much more work to do if it really wants to clean up California’s waterways and groundwater supplies. Some quotes stay with you forever. One that's stayed with me came from Rafael Centenera, a general assistant director in Spanish fisheries ministry, when I interviewed him in Vigo, Europe's busiest fishing port, in 2007. "For sure we are friends of fish," he said. "But still more, we are the friends of fishermen." The reason these 16 words have stayed with me is that they encapsulate perfectly the approach to managing fisheries that has held sway for many years in most of Europe and indeed much further afield. What it implies is that a bit of restraint and conservation is fine - so long as it doesn't get in the way of fishermen's profits. What that stance implies in Spain has been laid out more clearly than ever in a new report from the International Consortium of Investigative Journalists (ICIJ). According to their analysis, Spanish fishing has been subsidised to the tune of 5.8bn euros ($7.8bn, £5bn) since 2000. Those subsidies have spanned the scrapping of old boats and the building of new ones, and just about everything in between. And the number is so high that one in every three fish landed by Spanish boats is paid for in subsidy, ICIJ calculates. To anyone who's familiar with the issues, the findings won't come as any surprise; but it is nevertheless striking to have the scale of the subsidies laid out so starkly. Incidentally, on that same trip to Vigo, everyone connected with the industry claimed there were no subsidies, that everything had been ended. One skipper then undermined the case by telling me how little he had to pay for his diesel. The website fishsubsidy.org has also documented the scale of public support across the EU. Among other things, it has produced a list of vessels that were first subsidised in renovation, and then in destruction. In one Spanish example, money was awarded to the boat Mikel Deuna Primero for modernisation. Just 17 days later, more money was allocated for scrapping it. The ICIJ report also mentions that fishermen found guilty of fraud or other offences have continued to receive subsidies. And this theme is taken up in another new report, this time from Greenpeace. It concludes that a single family of fishing barons has amassed about 16m euros in subsidies, despite a series of arrests and convictions for offences such as smuggling, illegal shark-finning and falsifying records. Maria Damanaki, Europe's fisheries commissioner who's leading moves to reform the Common Fisheries Policy (CFP), says the accusations are being investigated. Spain isn't the only country that supports its fishing industry with subsidies that in theory do not exist. Ernesto Penas Lado, director of policy and enforcement at the European Commission's Directorate-General for Maritime Affairs and Fisheries, tells the ICIJ: "Spain has earned its bad reputation; the problem is others don't have the reputation, and deserve it just as much." But if European fisheries are to be put on a sustainable footing, Spain is the key nation. That's partly because it operates by far the bloc's largest fleet, and partly because it traditionally leads the process of political lobbying designed to ensure that authorities prioritise fishermen (at least, the big industrial companies that organise the lobbying) above fish in their hierarchy of friendship. But there's a huge disconnect here; because ultimately, keeping fishing at unsustainable levels is anything but friendly to fishermen. As the World Bank made clear a few years ago in its Sunken Billions report, the huge overcapacity of the world's fleets actually make the industry much less profitable, with about $50bn being poured into the sea every year. Cutting the overcapacity and allowing stocks to recover will in the end make for a financially healthier proposition. That's a reality that the authorities in Spain (and other countries) have routinely ignored. The situation has barely changed in years, with changes wrought in long-term management plans for species such as cod just a drop in the ocean. CFP reform - due to be completed in 2013 - is the biggest opportunity to put things right that there has been in years, and the biggest there is likely to be for many more. Yet pressure for reform from the "usual suspects" such as Greenpeace frankly appears unlikely to bring about major change, because the pressure has been there for years and has pushed governments only a small distance. So what might make a difference? One window of opportunity could be the financial mess in which Spain finds itself - not on the scale of Greece, but mentioned whenever the "who's next after Greece?" question gets asked. Some of its economic indicators are around the European average, but 20% unemployment is anything but - the highest in the bloc, in fact. If research is showing that cutting fishing capacity would increase revenues, why not demand Spain trims its industrial fleet as a condition for economic aid? If that brings just one of the World Bank's sunken billions into Spanish ports every year, that's one less billion the rest of the eurozone would have to find. The other window is surely provided by that unemployment figure. An industry that favours big industrialised fleets with a powerful lobby over small-scale, artisanal operations is inherently less sustainable from an ecological point of view, because fishermen who do not have the capacity to move somewhere else when stocks are depleted are more likely to look after their fishing grounds. It's also much worse socially. Globally, artisanal fishing snares less than half the world's total catch, yet provides 90% of the jobs. So a switch from large-scale industrialised fleets to small-scale localised effort would create employment, as well as increasing the chances of creating a more sustainable industry - which in turn means more profits down the line. Sounds like a way to be a better friend to both fish and fishermen; but don't hold your breath. A 44-foot long dead sperm whale lay on a beach in Redcar, England (May 2011). Rescuers were unable to save the whale, which washed ashore alive. New theories are emerging: is global warming, shipping traffic, or the Earth's magnetic field to blame? Wednesday's stranding and sad death of a 60-ft fin whale in the Outer Hebrides comes all too swiftly after what seems to be an unusually high number of unexplained whale mortalities this year – enough to puzzle any whale CSI forensics team. On 8 September a stranded fin whale died off Cleethorpes beach; on 23 September another fin whale died on the Humber, followed on 29 September by a rare sei whale in the same estuary (although my own research shows this was by no means unique. In 1888, a sei whale was harpooned and killed in the Solent, after following the Isle of Wight ferry from Portsmouth to Ryde). This year, two separate pods of pilot whales stranded in the Western Isles. Faced with yet another slumped and slowly expiring cetacean on the strand, scientists continue to be mystified by the cause for this run of whale casualties. But slowly, some new clues and possible culprits are emerging. Could global warming be to blame? The food sources on which whales subsist prefer cooler waters, being better able to hold oxygen. Noticeably warming waters may be driving whales, and their food, further north. Other possible causes for whale strandings – suspected in the pilot whale strandings this year - include parasitical infection of the brain with trematodes, and morbillivirus infection, which has the same kind of effect as canine distemper. Illness or other effects may cause the animals to become disorientated in their navigation. Some scientists speculate that cetaceans set their "travel clocks" by detecting minute changes in the geomagnetic field. Others hypothesise that the anomalies which may lead to strandings could even be created by solar activity known to affect the Earth's magnetic field – most visibly in the aurora borealis and australis. Bad weather may also play its part: strandings increase during and immediately after storms. Man-made problems may be to blame. Noise from boats, ever louder shipping traffic, seismic surveys for oil and military sonar are known to have sometimes fatal effects on animals that rely so heavily on their sense of sound. More insidiously, heavy metals, PCBs, DDTs and other organochlorines are entering the marine environment. Whales, at the top of the ocean food chain, are the final repository for this toxic cocktail. Sometimes they become the hapless victims of extraordinary combinations of all of these factors. In one recent instance in the Mediterranean, a group of seven sperm whales were panicked, possibly by the use of military sonar in exercises, into entering waters too shallow for them to feed. Weakened by thirst – whales get their water from what they eat, and so may die of thirst as they starve – the animals' internal systems began to break down their adipose fat in which these toxins were stored, relatively safely. By releasing these toxins into their own blood stream, they were in effect poisoning themselves. Finally the whales ran aground off Italy, where, like the fin whale yesterday, they succumbed to the sheer weight of their own bodies which crushed their internal organs. Is this what is happening around Britain's shores? As ever with whales, it is difficult to tell. Cetaceans spend all their lives in an environment which is alien to us. Ironically, however, whale strandings can be remarkably helpful. These deaths provide us with invaluable clues to the living animals about which we know so little. A fin whale stranded in Denmark last year, for instance, was thought to be about 15-20 years old, a juvenile. The results of its necropsy, released this summer, show that it was blind, arthritic, and 140 years old – thereby doubling, at a stroke, the known longevity of these animals. Given that it is believed humpback whales may live to 150 years old, and bowhead and North Atlantic whales up to 200-300 years, their very lifespans defeat our scrutiny. It is a salutary notion: whales may be simply too long-lived for us to study within our limited, human lives. BBC : Whale strandings: are we to blame? The curious mismapping of Greenland’s ice sheet cover by the venerable Times Atlas recently has excited a lot of outraged commentary. But few people noted that this follows an old tradition of speculative cartography of the polar regions. ‘Modern’ mapmakers as early as the 16th century combined real facts and scientific knowledge with fundamental misinterpretations of that knowledge to create speculative mappings of the world’s unknown shores – and nowhere was this more prevalent than at the poles. Early cartographers had a particularly difficult time mapping the Polar Regions. Factually, they based their maps on reports from mariners who dared sail the dangerous waters. This was supplemented by information from earlier maps, speculations based upon their personal theories of geography, religious beliefs, and the fiscal and political ambitions of their patrons. The earliest specific map of the North Pole is Gerard Mercator’s 1595 Septentrionalium Terrarum Descriptio (‘Northern Lands Described’, shown here is the 1606 edition). Mercator interprets a lost work known as the Inventio Fortunata (“The Fortunate Discovery”), which, though we don’t know for certain, supposedly refers to early journeys to Iceland and the Faeroes in the 14th century. Complementing and interpreting the Inventio, Mercator added real geographic knowledge collected by explorers Martin Frobisher (1535-1594) and John Davis (1550-1605) (amongst others). Mercator used the Inventio description of lands and peoples, Frobisher and Davis’s reports on currents, ice extent, and other elements, to compose this masterpiece of cartographic speculation. At the North Pole Mercator placed a great mountain, the Rupes Nigra (“Black Rock”) around which flows a mighty whirlpool (hence the strong currents recorded by Davis and Frobisher). From here four powerful rivers flow inward dividing a supposed Arctic continent into four distinct lands. Mercator referenced the Inventio to populate these lands with pygmies, Amazons, and other anomalies. Between Asia and America Mercator added another great sea mountain to which he ascribes magnetic properties. This mountain evolved from a pet theory devised by Mercator to explain magnetic variation. It is also noteworthy that the seas all around the poles are open and navigable – it is very likely Mercator had in mind the interests of royal patrons eager for a Northwest or Northeast Passage. 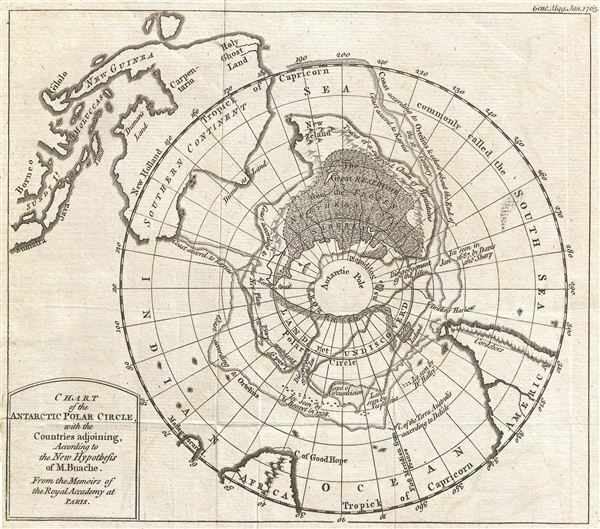 Two hundred and fifty years later, in 1763, the French geographer Phillipe Buache (1700-1773), issued another wonderful attempt to address the problematic Polar Regions. Buache drew this map to expound upon his own theory of water basins wherein he hypothesized that the Antarctic contained two distinct land masses separated by a frozen sea. From the frequency of icebergs seen by early explorers such as Halley and Bouvet, Buache presumed that there must be a semi-frozen sea at the South Pole. This sea, which he argued (correctly) could only be fed by mountains in the surrounding polar lands, disgorged ice into the southern seas. He thus maps “Land yet undiscovered” and “Frozen Sea as Supposed”, “Supposed Chain of Mountains” as well as other speculations. In order to conform not only to his own theories but to accepted mappings of this region by venerable cartographers of the 16th and 17th centuries such as Kaerius and Orteilus, Buache also joins New Zealand to the Antarctic mainland and adds an expansive reservoir he names “Siberia”. Buache was highly influential in his time and aspects of his geographical speculation found their way into numerous maps of the period. Maps such as these abound in early cartography and most, no matter how misguided, are genuine attempts to rectify the known and unknown. Some, like the maps above and the more contemporary Times Atlas’ map of Greenland, are derived from real scientific knowledge, but exhibit either a misunderstanding of geography or an erroneous hypothesis. These often lead to fictitious interpretations of factual data. Such errors do have ramifications. In the early days of polar exploration such maps often inspired to ill-fated nautical expeditions in search of pygmies, polar seas, and new lands. In modern times, such speculative mappings, both early and contemporary, have been used by some to disprove global warming, advocate for the continent of Atlantis, and prove that space aliens mapped the earth in antiquity. It should therefore probably be always borne in mind that cartography has always been a blend of art and science – which of course is one of the reasons why it so fascinates us. While the great North has their natural neon phenomena known as the Aurora Borealis, San Diego, California, has its own water-based version. The ocean glow is known as Red Tide and appears when billions of decaying single-cell organisms rapidly accumulate in a given water column, particularly on the coast. During the day it makes the water a rust color, but it's durning the darkness that the real spectacle takes place. When the sun goes down, the organisms produce a brilliant blue neon glow. The bioluminescent waves look as if they have an electricity coursing through them. Luckily, there's no radioactive elements here, just mother nature producing yet another awesome sight. The cool natural phenomena has been generating a ton of Youtube traffic and spawned a flood of amateur San Diego filmmakers, including surfers and kayakers whose sports have carved the neon ocean and left bright blue trails behind. Check out these Red Tide videos showing of a bioluminescent Pacific Ocean. This is a movie shot in Encinitas, Carlsbad and Oceanside, depicting a bioluminescent red tide that has been present in the coastal waters off San Diego. This particular species is called Lingulodinium Poleyedrum and emits a bright neon blue color when disturbed.